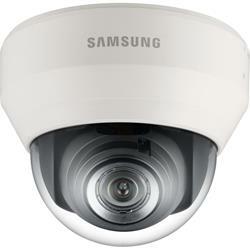 The SND-7084 features the most advanced WiseNetIII functions from Samsung with 3 megapixel 1080p high definition images. It's high level of functionalities includes 120dB Wide Dynamic Range which delivers 30fps at 3 megapixel 1080p, low light performance down to 0.1 lux (F1.2, 50IRE, color) creating clear images in low light conditions, and built-in 2.8x motorized varifocal lens which result in easy focus control. With enhanced features and new technologies to combat the challenges of tough environmental conditions, the SND-7084 will meet the professional security needs of the market.